Over a dozen years ago the late Doug Dunlop, designer of the Concordant range of valve preamplifiers, demonstrated something to me so forcefully that I had to re-evaluate my whole audio system. He took the chassis of the Excelsior pre-amp he was evaluating out of its steel sleeve case and played the same tune through it. It was a dramatic and repeatable improvement in sound quality, "Chalk & cheese" as he put it. Then he put the chassis into a specially made hardwood sleeve. There was a further tiny improvement on the no-box condition. Doug repeated this demonstration often enough with enough different models of pre-amp to convince me that the observed phenomenon was the same every time: repeatable empirical evidence. Being the inquisitive type I had to find out whether this phenomenon applied only to Doug's designs; or whether it was universal; or whether it changed with different materials; or whether it changed with different circuits, technologies, wiring methods etc. Consistently, undamped steel or aluminium cases are bad for sound quality, like really cheap circuit componants. The difference is like that of replacing all the cheap capacitors in a circuit and power-supply with Black Gtaes, Wondercaps and Musicaps. Talking to other audio experimenters and amplifier builders, they commented that the breadboard circuit often sounds worse when put into a case. But few had tried to find out why, or gone as far as Doug with a production item. Some tube amp builders expressed a preference for steel over aluminium. A solid-state builder expressed that aluminium is better, arguing that eddy currents were preferable to magnetic-hysteris. Denis Morecroft's DNM designs have been in acrylic cases for as long as I can remember for similar reasons, although they do attract dust. The higher-level Audio-Note products usually feature expensive copper chassis in place of the steel of the lower level products. Many big manufacturers now recognise the problem in particularly vibration sensitive devices (especially cd players) and mechanically damp the chassis or copper plate aluminium parts. 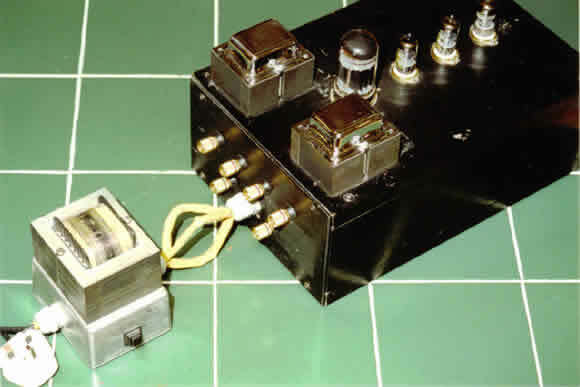 Describing DAC tweaking, one writer commented "A chance discovery manifests itself in an optional 3" circular hole cut in the Chorus chassis directly over the DITB chassis "[it] blew my mind", Mike Vans Evers (The Chorus: A multivocal tube output stage for your "DAC In The Box", Sound Practices Vol 2 #2, Summer 1994). He was describing just one experience of removing some sheet steel that was parallel with an audio pcb. I have tried casework various materials around hard-wired and pcb wired amplification circuits. In my experiments wood wins consistently. Hardwood, softwood, plywood all sound fine. I always have suitable bits of timber (lumber) remaindered from speaker projects. Real woods are nicer to have around than fibreboard or chipboard type materials, and there have been various doubts expressed about the health effects of the composite board adhesives to the extent of a court case in the UK brought against a manufacturer of chipboard and MDF flat-pack furniture (Observer newspaper, 8th April 2001) and a US report on toxicity in the home was mentioned in UK media recently. I have also tried special audio grade box materials eg Russ Andrews' RATA "Torlyte". Russ Andrews has also noted the phenomenon and has mounted his amplification products in various exotic cases over the years. Torlyte is a lightweight wood based hollow sheet material that is designed to minimise mechanical energy storage. Casework made from this material inexpensive, but arguably justified by the labour involved, to upgrade existing equipment and new-build. For me they work much better than the standard mass-market product steel box or aluminium case or pro 19" rack, but not much better than well designed and made wood cases. You could make them cheaper or commission cases from a local craftsman, or buy any wood box at a crafts store. The downside of wood as a material for housing gain circuits is their total absence of screening. There is always the necessity of screening the circuit, especially with wideband circuits in our RF saturated city environments. Worst offenders will be phono-stages (especially wideband moving coil circuits), cd players (which will emit as well as pick up copious quantities of RF if inadequately screened) and tuners (obviously). I was plagued by taxi radio messages from a rehoused moving coil head amp, until I added copper screening. Each wooden box side may be approximately lined with thin copper sheet (star-grounded) to provide adequate RF screening; it doesn't have to be completely lined, just enough to make an effective Faraday cage. Wood is good for amplifiers & cd players. You can work it easily with domestic tools. It's relatively cheap, plentiful and environmentally friendly. It looks better in most homes than black painted tin-boxes. Most importantly, your project will sound better in a well designed and made wooden case than ferrous or aluminium.